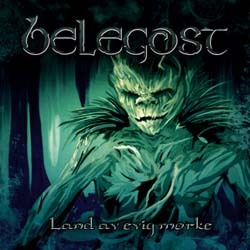 Polish folk metallers Belegost from Lublin have announced the release of their debut EP. It is entitled “Land av Evig Morke” and will be self released on 29th November 2013 on professional CD. Belegost is a very new band and they’ve been actually playing together since January 2013. Their music is folk extreme metal with a lot of fantasy influences. They combine violins, energetic keys, dynamic percussion, powerful guitars, brutal and clean vocals, both male and female. Cover and booklet artwork is made by Barbara Gnyp, a friend of the band. They have unveiled the cover as well as “Land av Evig Morke” tracklist.